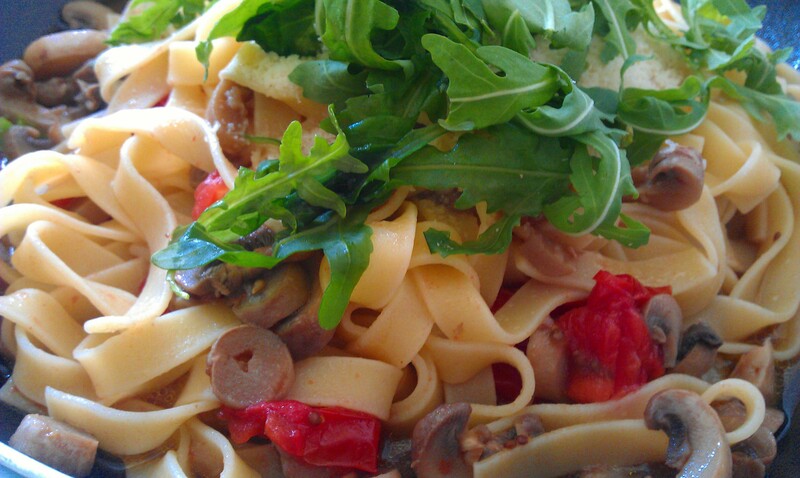 Easy, fresh and light tagliatelle recipe | HOLY FORK! Perfect for a summer day. This recipe is easy and super quick, but the taste is still rich and awesome. I really love this kind of pasta, the only little problem is that it tends to get cold quite quickly, so make sure you serve it immediately when it is ready. I am not going to specify the quantities for each ingredients because it really depends on the amount of pasta you are preparing. a bit of onion finely chopped. Pour the oil and the onion in a pan and stir fry gently for a few seconds. Then add the chopped mushrooms and when they are almost ready add the tomatoes cut in halves. Don’t overcook them or the mushrooms will turn too dark and the tomatoes will mash. You should also make sure it doesn’t get too dry or the whole dish will be just sticky and impossible to eat. Add some salt according to tastes. In the meantime cook the tagliatelle. Drain them when they are still al dente and make sure you save part of the cooking water, because you might need it later when mixing the pasta with the sauce in case it is all too dry. Put the tagliatelle in the pan and mix together for a few second on a low heath. Once the pasta is well mixed with the sauce, add the parmesan, pepper and finish with some rocket on the top. This entry was posted in Food, Recipes and tagged Food, Pasta, Recipes, Tagliatelle, Tomatoes by Holyfork. Bookmark the permalink.